The film was announced in October 2014 as Avengers: Infinity War – Part 2. The Russo brothers came on board to direct in April 2015, and by May, Markus and McFeely signed on to script the film. In July 2016, Marvel removed the title, referring to it simply as Untitled Avengers film. Filming began in August 2017 at Pinewood Atlanta Studios in Fayette County, Georgia, shooting back-to-back with Infinity War, and ended in January 2018. Additional filming took place in the Downtown and Metro Atlanta areas and New York. The title was revealed in December 2018. Gwyneth Paltrow as Virginia "Pepper" Potts: Stark's fiancée and the CEO of Stark Industries, who will wear a powered exosuit of armor in the film. This will be Paltrow's final major appearance as Pepper in the MCU. Additionally, Frank Grillo and Letitia Wright reprise their roles as Brock Rumlow / Crossbones and Shuri from previous MCU films. Hiroyuki Sanada and Katherine Langford have been cast in undisclosed roles. Avengers co-creator Stan Lee has a posthumous cameo in the film. Germain Lussier of io9 spoke on the approach Marvel might have to take in marketing the film, given the end of Infinity War, which sees many established characters die. He questioned if those characters would appear on posters and in toy campaigns, and if the actors portraying them would participate in press events leading up to the film's release. Lussier felt Disney and Marvel could focus on the original Avengers team members, who make up the majority of the living characters, but noted it would be more beneficial to show the return of the dead characters, which would "build a mystery and curiosity about how they come back. It could create a whole new level of interest about the film while having all the stars front and center, as they should be". In June 2018, Feige spoke to this, stated that these dead characters would not be featured in any marketing for the film, though the decision regarding that could change. He presented a behind-the-scenes video from the film at CineEurope, and said that the official marketing campaign for the film would begin at the end of 2018 with the announcement of the film's title then. In early December 2018, ahead of the first trailer's release, Graeme McMillan of The Hollywood Reporter spoke to the "fevered anticipation" surrounding it. McMillan felt what was so remarkable about the anticipation, was that it was mostly "fan-created, without noticeable direction from Marvel or the filmmakers involved" and that the amount of knowledge surrounding the film without any type of promotion was "a kind of brand awareness that most studios would kill for". Because of this, McMillan urged Marvel not to release any trailers for the film since "the advanced level of enthusiasm that's already out there for the movie... is only likely to build as it gets closer to" the film's release. That said, he added the eventual release of the trailer would take away the "Schrödinger's cat-esque position... it currently enjoys" as it was "almost guaranteed to disappoint fans, who have by this point built up their own personal trailers filled with whatever moments are essential to their enjoyment of a good teaser". Also in December, Audi confirmed that its Audi e-tron GT Concept car would make an appearance in the film. The first trailer for the film was released on December 7, 2018. Dustin Sandoval, the vice president of digital marketing for Marvel Studios stated the marketing team "actively made the choice not to include the title or hashtag of the movie in our trailer posts so fans could see it at the end reveal without it being spoiled". Richard Newby, also of The Hollywood Reporter felt, while not much new was revealed in the trailer, it "offers a somber glimpse of a universe made unrecognizable" and lets the viewer "sit, rightfully so, with the ending of Avengers: Infinity War and our questions of loss". Newby also noted how the trailer "calls back to beginnings of the MCU... [as] the visual language used in the trailer does a great service by highlighting these characters' humble beginnings", and concluded it leaves viewers with "just as many questions as we had before". Austen Goslin of Polygon pointed out that the title not only references a line Doctor Strange tells Tony Stark in Infinity War, but also a line spoken by Stark in Avengers: Age of Ultron. Goslin, who felt this was "probably [not] an accident", said, "The scene surrounding this line in Age of Ultron is one of the most important ones in the movie. Things look dark, and the group of heroes face an enemy they don't think they can defeat." 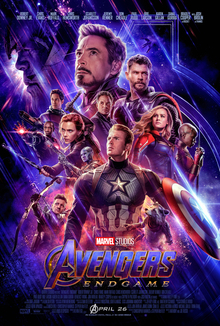 As such, the Endgame trailer "mirrors this perfectly" and "shows us that the Avengers' two most prominent characters are who they've always been: Iron Man, a pessimist who keeps fighting no matter how hopeless things look, and Captain America, an optimist who believes that nothing is hopeless when the world's heroes fight together". The trailer was viewed 289 million times in its first 24 hours, becoming the most viewed trailer in that time period, surpassing the record of Avengers: Infinity War (230 million views). The trailer also set a record for Twitter conversation for a film trailer in the first 24 hours generating 549,000 mentions. By January 3, 2019, BoxOffice revealed their "Trailer Impact" metric service indicated approximately 77–78% of people surveyed who viewed the Endgame trailer in the past three weeks expressed interest in seeing the film. In the three weeks it was measured by "Trailer Impact", it was number one for all, and had the top two percentage of respondents express interest in seeing the film since the service's introduction in March 2018. In late December 2018, the film was named as the second-most anticipated 2019 film by IMDb, the most anticipated blockbuster of 2019 according to the ticketing service Fandango, and the most anticipated superhero and overall film by Atom Tickets. 1 2 Hullfish, Steve (April 29, 2018). "Art of the Cut with Avengers – Infinity War editor, Jeffrey Ford, ACE". Pro Video Coalition. Archived from the original on December 22, 2018. Retrieved December 22, 2018. ↑ "'Avengers: Endgame". Disney.com.au. Retrieved February 7, 2019. 1 2 3 Mithaiwala, Mansoor (October 28, 2017). "Robert Downey Jr. Announces Avengers 4 Return". Screen Rant. Archived from the original on November 4, 2017. Retrieved November 4, 2017. 1 2 Breznican, Anthony (March 8, 2018). "Behind the scenes of Avengers: Infinity War as new heroes unite — and others will end". Entertainment Weekly. Archived from the original on March 8, 2018. Retrieved March 8, 2018. ↑ McMillian, Graeme (September 7, 2018). "Mark Ruffalo Suggests 'Avengers 4' Is Still 'In Flux'". The Hollywood Reporter. Archived from the original on September 8, 2018. Retrieved September 8, 2018. ↑ "Chris Evans Agreed to Avengers 4 Because It's 'Going to Wrap Everything Up'". Superhero Hype. June 11, 2017. Archived from the original on June 12, 2017. Retrieved June 12, 2017. ↑ Welch, Alex (August 22, 2017). "Black Widow Heads to Japan in Avengers 4 Set Photos". Screen Rant. Archived from the original on August 23, 2017. Retrieved August 22, 2017. ↑ Damore, Meagan (September 21, 2017). "Paltrow Confirms Avengers 4 Role for Cheadle's War Machine". Comic Book Resources. Archived from the original on September 21, 2017. Retrieved September 21, 2017. ↑ Kit, Borys; Couch, Aaron (April 18, 2017). "Marvel's Kevin Feige on Why the Studio Won't Make R-Rated Movies, 'Guardians 2' and Joss Whedon's DC Move". The Hollywood Reporter. Archived from the original on April 18, 2017. Retrieved April 18, 2017. ↑ Perry, Spencer (October 26, 2017). "More Avengers 4 Set Photos Featuring Hulk, Black Panther, and More". ComingSoon.net. Archived from the original on March 26, 2018. Retrieved March 26, 2018. ↑ Radish, Christina (August 15, 2017). "Paul Bettany on 'Manhunt: Unabomber', Understanding Ted Kaczynski, and 'Avengers: Infinity War'". Collider. Archived from the original on August 21, 2017. Retrieved August 21, 2017. ↑ Ellwood, Gregory (September 11, 2017). "Sebastian Stan Says Marvel Studios Training Put To Good Use On 'I, Tonya' [Interview]". The Playlist. Archived from the original on July 25, 2018. Retrieved September 15, 2017. ↑ Mueller, Matthew (September 21, 2018). "Benedict Wong Teases 'Avengers 4' Spoilers Cleaning". Comicbook.com. Archived from the original on September 22, 2018. Retrieved September 22, 2018. 1 2 Sandwell, Ian (September 29, 2017). "Another Guardians of the Galaxy star confirms they'll be coming back for Avengers 4". Digital Spy. Archived from the original on October 1, 2017. Retrieved September 30, 2017. ↑ Armitage, Hugh (August 31, 2018). "Exclusive: Guardians of the Galaxy Vol 3 delay might affect Avengers 4's plot, according to Dave Bautista". Digital Spy. Archived from the original on September 1, 2018. Retrieved September 1, 2018. ↑ Deen, Sarah (April 24, 2017). "Has Guardians of the Galaxy star Zoe Saldana revealed the name of Avengers 4?". Metro. Archived from the original on April 24, 2017. Retrieved April 24, 2017. ↑ Keene, Allison (May 4, 2018). "'Avengers: Infinity War' Soul Stone Theory Confirmed by Director". Collider. Archived from the original on December 15, 2018. Retrieved December 15, 2018. ↑ Evans, Mel (October 7, 2018). "Bradley Cooper asked Avengers 4's Russo Brothers if they altered Rocket's voice for Infinity War". Metro. Archived from the original on October 9, 2018. Retrieved October 9, 2018. ↑ Tramel, Jimmie (September 23, 2018). "Tulsa-bound actor Sean Gunn knows Marvel-ous details, but can't share yet". Tulsa World. Archived from the original on September 25, 2018. Retrieved September 25, 2018. 1 2 Damore, Meagan (August 22, 2017). "Avengers 4 Set Photos Capture Iron Man Character's Return". Comic Book Resources. Archived from the original on August 23, 2017. Retrieved August 22, 2017. ↑ Boucher, Geoff (November 30, 2018). "Spider-Women, Captain Marvel & Harley Quinn: Females Fly In The Face Of Old Hollywood Perceptions". Deadline Hollywood. Archived from the original on December 1, 2018. Retrieved December 1, 2018. ↑ Ridgely, Charlie (February 19, 2019). "Gwyneth Paltrow Announces Retirement From Marvel Cinematic Universe". Comicbook.com. Archived from the original on February 22, 2019. Retrieved February 21, 2019. ↑ Dolloff, Matt (July 30, 2017). "Josh Brolin Announces Return For Avengers 4 Filming". Screen Rant. Archived from the original on November 4, 2017. Retrieved November 23, 2017. ↑ Schmidt, JK (December 22, 2018). "'Avengers: Endgame' Directors Explain How Thanos and the MCU Have Changed". ComicBook.com. Archived from the original on December 24, 2018. Retrieved December 24, 2018. ↑ Stern, Marlow (September 29, 2014). "Jeremy Renner Opens Up About Marriage, His Problems with the Media, and the Future of Hawk-Eye". The Daily Beast. Archived from the original on June 25, 2015. Retrieved June 24, 2015. ↑ Ricwulf, Daniel (October 24, 2015). "Jeremy Renner & Michael Douglas Hint at Marvel Team-Up". Screen Rant. Archived from the original on October 26, 2016. Retrieved October 25, 2016. ↑ Coggan, Devan (September 5, 2018). "Brie Larson takes flight as Captain Marvel on this week's EW cover". Entertainment Weekly. Archived from the original on September 6, 2018. Retrieved September 5, 2018. ↑ Keyes, Rob (March 23, 2018). "Avengers 4 Writers Had Fun With Captain Marvel's Unprecedented Power Level". Screen Rant. Archived from the original on March 23, 2018. Retrieved March 23, 2018. ↑ Petski, Denise (September 15, 2017). "'Westworld': Hiroyuki Sanada Set To Recur in Season 2 of HBO Series". Deadline Hollywood. Archived from the original on September 15, 2017. Retrieved September 15, 2017. ↑ Gonzalez, Umberto (October 26, 2018). "'13 Reasons Why' Star Katherine Langford Joins 'Avengers 4' (Exclusive)". TheWrap. Archived from the original on October 26, 2018. Retrieved October 26, 2018. ↑ Strom, Marc (April 7, 2015). "Joe & Anthony Russo to Direct 2-Part Marvel's 'Avengers: Infinity War' Event". Marvel.com. Archived from the original on April 7, 2015. Retrieved April 7, 2015. ↑ Strom, Mark (May 7, 2015). "Christopher Markus & Stephen McFeely to Write Marvel's 2-Part 'Avengers: Infinity War' Event". Marvel.com. Archived from the original on May 8, 2015. Retrieved May 7, 2015. ↑ McNary, Dave (July 29, 2018). "Marvel's 'Avengers: Infinity War' Will be One Movie, Not Two". Variety. Archived from the original on October 27, 2018. Retrieved October 27, 2018. ↑ Eisenberg, Eric (April 23, 2017). "Why Avengers 4 Doesn't Have A Title Yet, According To Kevin Feige". Cinema Blend. Archived from the original on April 24, 2017. Retrieved April 24, 2017. ↑ Perry, Spencer (August 10, 2017). "Avengers 4 Filming Has Begun!". ComingSoon.net. Archived from the original on August 10, 2017. Retrieved August 10, 2017. ↑ Marc, Christopher (June 14, 2017). "'Avengers 4' aka 'Mary Lou 2' Shoots July–December in Atlanta". Omega Underground. Archived from the original on June 15, 2017. Retrieved June 14, 2017. ↑ Melrose, Kevin (July 14, 2017). "Avengers: Infinity War Appears to Have Wrapped Filming". Comic Book Resources. Archived from the original on July 14, 2017. Retrieved July 14, 2017. 1 2 Cabin, Chris (January 14, 2016). "'Captain America: Civil War' Directors on Landing Spider-Man, 'Infinity War' Shooting Schedule". Collider. Archived from the original on January 14, 2016. Retrieved January 14, 2016. ↑ Dominguez, Noah (January 16, 2019). "Avengers: Endgame Reshoots Bring Back Two Guardians of the Galaxy". Comic Book Resources. Archived from the original on January 16, 2019. Retrieved January 16, 2019. 1 2 Truitt, Brian (December 7, 2018). "It's finally here! Watch the first trailer for Marvel's newly titled 'Avengers: Endgame'". USA Today. Archived from the original on December 7, 2018. Retrieved December 7, 2018. ↑ McMillan, Graeme (November 8, 2018). "'Avengers 4' Runtime Is Currently 3 Hours". The Hollywood Reporter. Archived from the original on November 28, 2018. Retrieved November 28, 2018. ↑ Lussier, Germain (May 7, 2018). "The Sequel to Spider-Man Homecoming Spans the Globe". io9. Archived from the original on May 7, 2018. Retrieved May 8, 2018. ↑ Lussier, Germain (June 26, 2018). "The Avengers 4 Trailers Are Going To Have A Weird Marketing Problem". Gizmodo. Archived from the original on June 26, 2018. Retrieved June 26, 2018. ↑ Whitbrook, James (June 15, 2018). "Don't Believe the Ridiculous Avengers 4 Rumors Floating Around Right Now". io9. Archived from the original on October 18, 2018. Retrieved October 17, 2018. ↑ McMillan, Graeme (December 4, 2018). "What 'Avengers 4' Trailer Fever Should Teach Marvel". The Hollywood Reporter. Archived from the original on December 6, 2018. Retrieved December 6, 2018. ↑ Markovich, Tony (December 4, 2018). "Audi E-Tron GT Concept confirmed for 'Avengers 4'". Autoblog.com. Archived from the original on December 11, 2018. Retrieved December 11, 2018. 1 2 Newby, Richard (December 7, 2018). "The Tragic Symmetry of 'Avengers: Endgame'". The Hollywood Reporter. Archived from the original on December 7, 2018. Retrieved December 7, 2018. ↑ Sandoval, Dustin [@DustinMSandoval] (December 7, 2018). "It's probably gone unnoticed but we actively made the choice not to include the title or hashtag of the movie in our trailer posts so fans could see it at the end reveal without it being spoiled. Then the title started trending within 10mins of the launch. We tried!!" (Tweet). Archived from the original on December 10, 2018. Retrieved December 10, 2018 – via Twitter. ↑ Goslin, Austen (December 7, 2018). "Avengers: Endgame's title ties together a long-running Avengers theme". Polygon. Archived from the original on December 10, 2018. Retrieved December 10, 2018. ↑ Rifkin, Jesse (January 3, 2019). "Trailer Impact: 'Lego Movie 2' Posts Highest Recall w/ 24.7%; 'Avengers: Endgame' Posts Near-Record Interest in a Cinema View at 78.1%". BoxOffice. Archived from the original on January 3, 2019. Retrieved January 3, 2019. ↑ McNary, Dave (December 28, 2018). "'Avengers: Endgame,' 'Captain Marvel' Among Fandango and IMDb's Most Anticipated Movies of 2019". Variety. Archived from the original on January 2, 2019. Retrieved January 2, 2019. ↑ Hayes, Dade (December 31, 2018). "'Avengers: Endgame,' 'Captain Marvel' Rated By Atom Tickets As Most Anticipated 2019 Film Releases". Deadline Hollywood. Archived from the original on January 2, 2019. Retrieved January 2, 2019.